Plummeting temperatures in the Unites States and Canada have caused chaos for many but have created a spectacular sight at Niagara Falls. 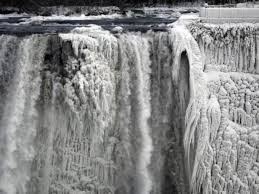 Visitors who normally see a thundering waterfall have travelled to see part of the cascades frozen solid. After nine months of growth, surgeons say that the nose is in good shape and the transplant will be performed soon. The UK's Leilani Franco - a contortionist who serves and drinks tea by using her feet - is among the stars listed in the new Guinness World Records to be released on Thursday. Also, you can see a robot with more than 8 metres, a skateboarder goat in a long walk, a small car and a man who has a collection with 322 different models of vacuum cleaners. Science sheds light on the moment our lights go out.